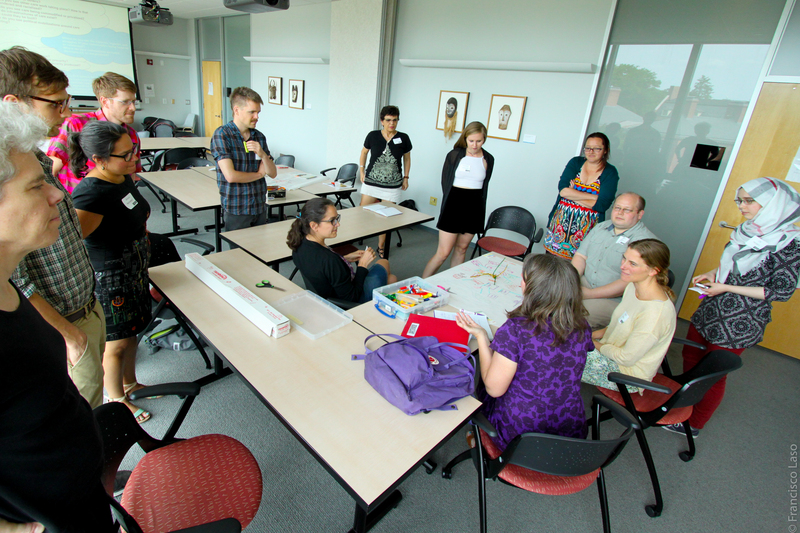 Last May, 3Cs facilitated a workshop on mapping spaces of precarity and spaces of care at the Feminist Geography Conference in Chapel Hill. In the Counter Cartographies Collective, we have long been concerned with increasing precaritization in the university, not only in terms of working conditions but also the precaritization of other facets of life and knowledge production. Yet more than a description of current trends, we have understood the concept of precarity as a tool that might allow for remapping new ties of solidarity and the emergence of an ethics of care. In this workshop, we will be collectively mapping out how the university both produces precarity and also serves as a site of resistance to it. We will look at spaces where we feel threatened, isolated, marginalized, or precarious, as well as the spaces of possible or already existing alternatives, spaces where we feel cared for, where community is being built. 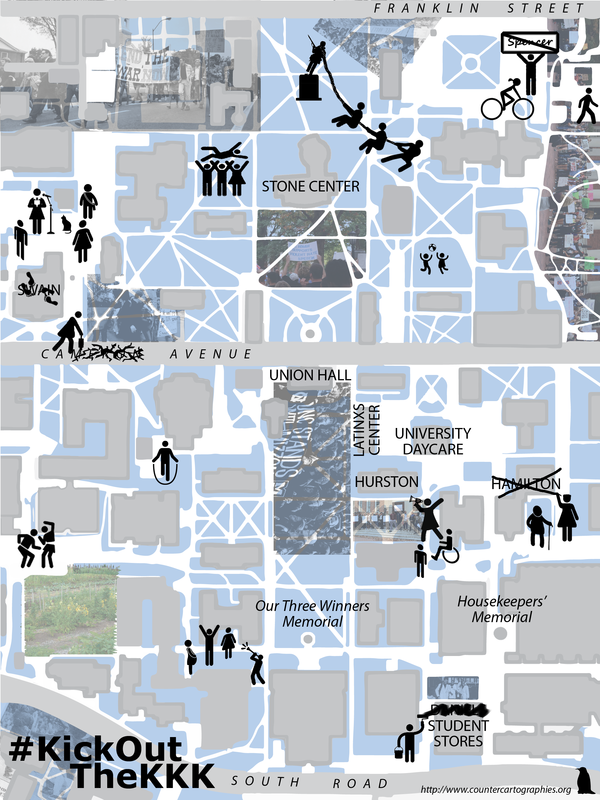 While we will particularly look at the campus space, we also hope to focus on the connections between the university and other places, such as the home and the city. 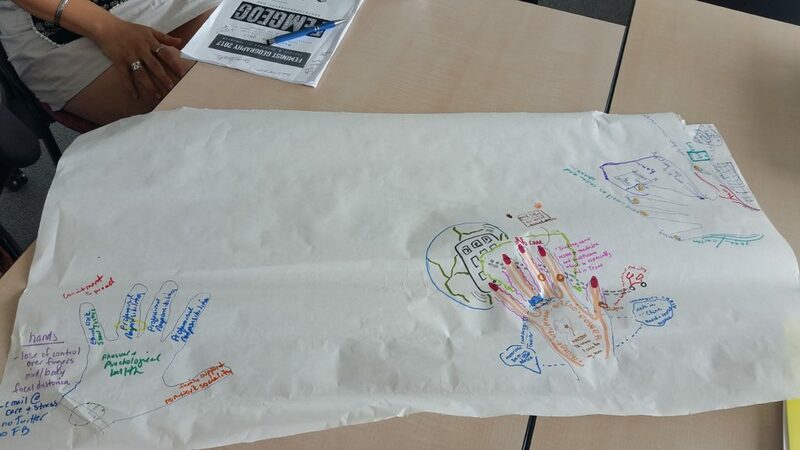 A second group made a concept map linking spaces and experiences of precarity, also showing how different people can experience different places differently — the gym, the forest, the coffee shop, are spaces where some people feel cared for an others don’t. 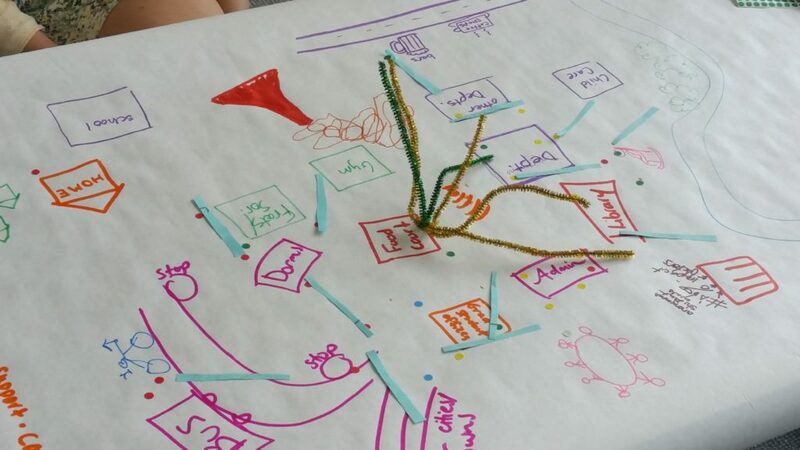 Another group mapped spaces where people feel support and cared for versus spaces of precarity, also highlighting the role of the internet and virtual spaces. 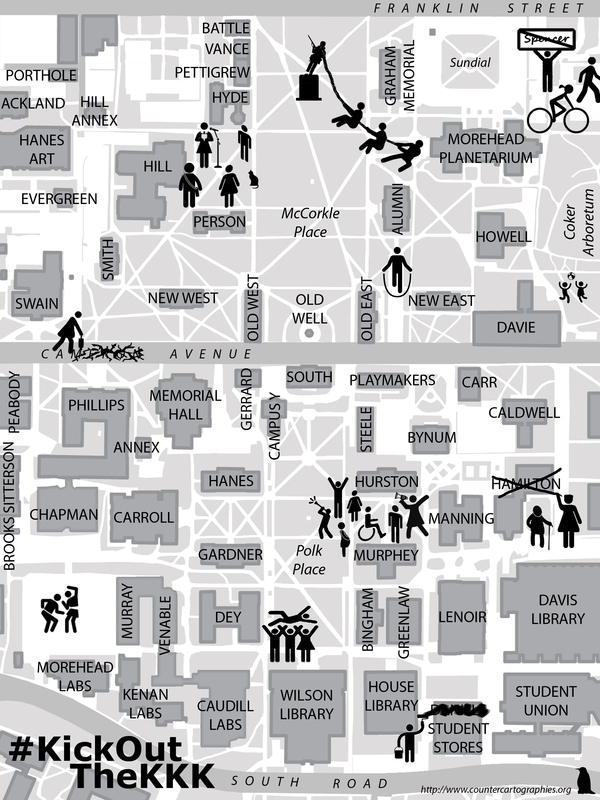 We can draw some initial conclusions from this mapping… First, the importance of bodies/embodiment – both in how we feel and experience precarity and lack of care and bodies carrying out the material labor involved in “immaterial” academic labor, as well as the specificity of different bodies in experiencing different spaces differently. Second, that the university is routinely experienced as a space of precarity, albeit in different ways, and there seems to be very little opportunity for constructing any lasting spaces or infrastructures of care within the university. 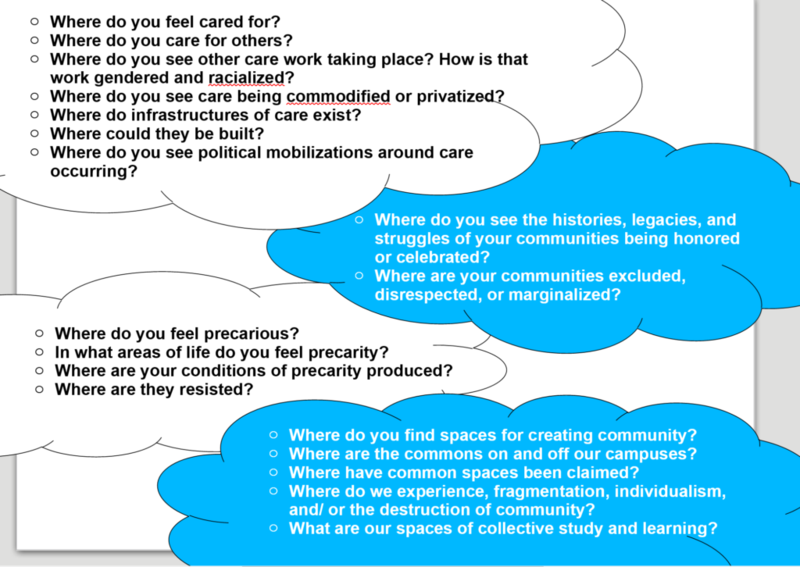 What there might be, however, are moments or tactics of care and links to spaces of care outside of the university. And finally, that care is a lot of work! 3Cs was invited to guest lecture/prepare a mapping activity for the Comparative Approaches to Global Issues course at Duke in April. After lecturing about countermapping in general and going over how to use some simple web mapping tools, students were divided into groups to research specific questions about Duke and make their own maps. Read more about the activity we prepared and see pictures below! Where is Duke? While Duke’s campus may seem to have clearly delimited spatial boundaries, Duke’s influence extends well beyond these limits: Duke’s students and employees live throughout Durham with consequent effects on the urban landscape, students travel, volunteer and study abroad around the world, Duke partners with a wide range of businesses taking part in different commodity chains. 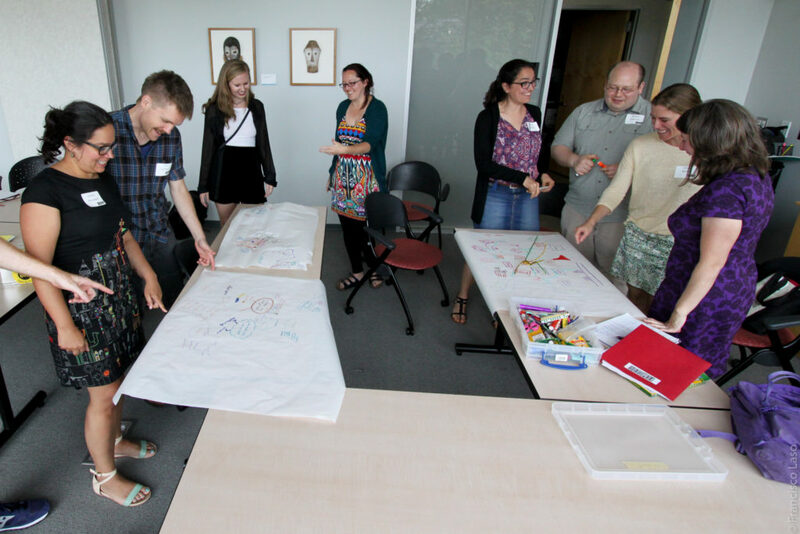 This activity is designed to explore and map out the different practices and institutions that make up Duke and Duke’s connections and effects on its local as well as global surroundings. There are seven themes each addressing a specific aspect of these overarching questions. Each group will be assigned one of these themes and will be responsible for gathering data on their topic by using all or some of the research methodologies described in detail under each theme.